Today I am continuing my Disassociation Series, and this week we are dealing with obligation clutter. This is a tricky one because it is easy enough to identify these items and know you want to get rid of them but there is a fear that you may offend someone else should they find out you have . I have to be honest here in saying that the only thing really standing in the way of getting rid of these objects is YOU! You are afraid it will hurt a friend’s feelings. You are afraid it will hurt your relationship with family. You are afraid to approach this person and offer the object back if that is the best solution. You are afraid of communicating your feelings when people offer you these objects in the first place and accept them whether you want them or not. You are afraid of a little discomfort should someone be bold enough to confront you on the absence of an object. You are probably falsely attaching too much importance to the object based on the person who gave it to you. You may also feel it is somehow disrespectful to part with objects left to you by a loved one who has passed. At this point, I know I have probably offended a few of my readers with my suggestions. I am willing to take that risk in the attempt to help you to take a risk to make the space you live in be the best, most comfortable, most rewarding, easy to care for, tranquil place it can possibly be. It is after all * Your space * Your home * Your sanctuary * Your life * Yours to take care of * Your time * Your freedom to do with it what you please. …but my mother is the type of person who gets really offended over this sort of thing. And that situation isn’t going to change if everyone keeps pandering to that behaviour. If she confronts you on the issue, politely explain to her that you no longer wanted to keep the item for whatever reason and let her deal with her own feelings on the issue. She is your mother and I am sure in the end your love is more important to her than stuff. …but my mother-in-law loves to knit me stuff and I don’t want to hurt her feelings. If she cares that much for you she will understand. Communication is what is lacking here, she probably keeps making you stuff because you keep accepting it. All you need to say is that you appreciate everything that she does for you but you don’t need any more (fill in the blank) as you have more than enough already. …but my father handed this desk down to me, it was once his fathers and his fathers before that. That may be a good reason to keep it but if you truly don’t want it, ask your father to entrust it to another member of the family who will cherish it in their home. He cared enough to offer it to you I am sure he cares enough for you not to hold a grudge against you for not wanting it. I know you are probably thinking “You make it sound like it is so simple, but it isn’t!” and in some cases you are probably right. What I suggest is to give it a try, get rid of one thing on your obligation clutter list and see what happens. Pick an item least likely to cause a problem and be brave. If the person involved doesn’t mention its absence or doesn’t suddenly start giving you the cold shoulder then you can consider it a success and move on to the next object. Quite often the situation is only as big as you blow it up to be in your own mind. Just to prove that people do survive these encounters I will give you some examples. One of the first things I decluttered was a silver tea set my parents gave me for my 21st birthday. Yes, I did consider at the time that my parents may notice its absence. My parents have since visited my home and I have visited theirs and nothing has been mentioned about the missing tea set. I can only assume that they either didn’t notice or they did and weren’t mortally offended. Either way I am happy not to have to polish it any more. My son brought out a batch of T-shirts to be decluttered last week and among those was one that his dad and I had bought him when we were in Italy last year. I knew he had never worn it, I also know he is very particular about what he wears and I am not offended that he has decluttered it. He also knew when he gave it to me to declutter that I had given it to him but he is clearly secure enough in our relationship not to be concerned about my reaction. When I went to visit my mother recently she offered me to take whatever I wanted from her china cabinet. Her plan is to offer these items to each of her children and grandchildren, so these treasures end up with those who truly appreciate them. I politely declined the offer because, although she has many beautiful things, I have no need or want for them. If she was offended she sure didn’t show it and she is still phoning me to say hello so no problems there. Some years back my mother suggested I buy her a set of salt and pepper grinders for her Christmas gift and I did so. I chose a good brand with a lifetime warranty. As I had moved overseas, it was three years before I visited my parents home again. This gift was nowhere to be seen even though the warranty suggested they should have been around for many years to come. What happened to them? I don’t know because even though I noticed their absence I was not at all offended by it and wasn’t about put my parents an awkward position by inquiring. My point here is that ultimately its our relationships with people that truly matter not relationships with stuff. Anyone who truly cares for you will not be offended by the fact that you decluttered something that they gave you. Yes, they might notice but etiquette should prevail in such a situation and, if an inquiry of an item’s whereabouts is made, provide an honest response that should also be accepted with grace. 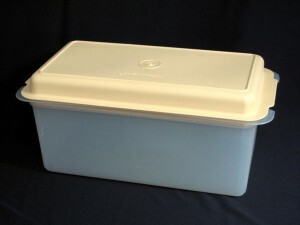 I have been selling some items on ebay again and this Tupperware bread keeper sold for $15.50. I underestimated the postage on this item and lost out there but this is the first time I have made that mistake so I’ll chalk that up to experience. Postage can be a case of swings and roundabouts sometimes because I overestimated on the postage for an item some time ago that more than makes up for this mistake. Getting to the bottom of my to do list. It wasn’t a big one but it always feels good to get commitments our of the way. Having my chores out of the way early makes me feel that everything else I get done is a bonus. I have a busy week ahead so it is good to get a jump start. I think this is a great post. My attitude about things is that if they have been given to me then they are a gift. Once given a gift is just that, a gift. There is no obligation to hold onto the gift. If others think differently then that is fine but that is on them not me. I have an aunt who places semtimental value on everything she receives and holds onto it for life because of who gave it to her. She has barrels of stuff in the rafters of the garage because of this. Barrels that have been there since they moved to that house 35 years ago–and have never been opened in that time. I do not attach sentimental value to anything. I place value in relationships. I don’t need a thing to remember someone. good for you! I sometimes think my friends think I am a little strange because I hold this attitude but then they know me as a loving generous person too. If a person can be a combination of these two things then it just goes to prove you don’t have to be heartless to detach yourself for material objects, just sensible! Deb J, I do have a question for you that has me a little confused. Are you the same Deb J that has been commenting for a long time but now have a new address or are you a new deb J that I should be welcoming to my blog? I struggle with this approach, because I believe that if we choose to declutter rather than consider our loved ones’ feelings, it can be detrimental to our relationship with those loved ones. As you said, the important thing in life should be our relationships with people, not our relationships with stuff, so IF my relationship with someone will be injured by getting rid of their gift and IF I know that is likely to be the case, then I am damaging our relationship. Put another way: if a loved one gives me a gift, and I then choose to part with that gift, and if that loved one will be hurt by that, and I know they will be hurt, and I do it anyway, then I feel it is an uncaring act, and if I commit enough of these uncaring acts, I become an uncaring person, at least in one aspect of my life. I am not suggesting we keep everything, but I caution against being ruthless in considering ONLY our own space, our own homes, our own feelings, in this process. Perhaps as in everything else, moderation truly is the key. I see what you’re saying, but in my belief, relationships are more than just the things in our lives. Would they be mad if that wasn’t the object I saved from a burning building, or would they be glad I had some use out of it and I was alive and well? Maybe a bit extreme and a little silly for an example, but it’s food for thought. Everyone has their own decluttering point though. I know I’ve been at a brick wall for ages and I’m actually on a time clock! Thank you, Lynn. I appreciate hearing others take on this. Maybe I need to be on a time clock too – maybe I’d get more done! I know where you are coming from here and I understand your trepidation in causing upset to someone else. In some cases it would be a hard call to make and perhaps a compromise would have to be reached in order to keep the peace but I would prefer to think that no one that loves you is beyond a request for their understanding in a situation such as this. Do you not think that any person would not understand if you went to them and said ~ “I have decided to live a life with less and am reducing my belonging to a more minimalist level. The object of this exercise is to make my home more spacious, calming and easier to care for. The things I have decided to reduce will be donated to charity or sold and among those things are items you have given to me. I want you to know that I appreciate your generosity of the beautiful gifts you have given me over the years and this is in no way meant as an insult to you. I would like to give you the opportunity to have any items back that you think you would like and even to chose from other items I will be sending on. In future rather than receiving gifts I would prefer to just enjoy each others company on special days and I hope you will be OK with that. I also understand that the sacrifices in relationships have to go both ways and that being ruthless as you say in considering ONLY our own feelings does sound a little one sided. I also think it is only fair to give the other person the benefit of the doubt in the form of an opportunity to dispel our beliefs that these objects are more important to them than our desire to change our lifestyle. Give them the opportunity to voice their thoughts by opening a conversation like the one above. If they seem distressed by the very thought then maybe that should be the key to make the compromise. Colleen, you have such a lovely way of putting things very diplomatically. I think this would work very well, and between that and my willingness to compromise where necessary I can find a balance that works for everyone. thank you for your kind words. The beauty of having the internet as a medium for conversation is I have time to think before my words come out, I am not so adept in person at times. 😆 Tomorrow night I am doing a live spot on National Radio at 10pm. As if foot in mouth isn’t a big enough risk when I am alert and talking in person, imagine my fear of what could come out on national radio when I have to speak of the cuff at 10 o’clock at night. Wish me luck! I will also reuse your words. You are so tactful. I’ll try that with some mother’s day gifts my kids brought back from school. Thanks. By the way welcome to my blog and thank you for dropping by with a comment. I hope you will join us often. May I wish you all the best, Colleen, it sounds more than a little scary! I did an interview for the local newspaper today and that went well so I hope that carries through for tomorrow. It helps if the interviewer has done their research and ask the right question that you just can’t help but be enthusiastic about answering. Good luck with the radio spot!! You did a great job on the other interview and I suspect this will be no different! I am glad that you were prepared to make your stand and that your mother understands your wishes. I know that this can be a very difficult position to be in and to put someone else in but overindulging children is one of those areas where a parent has to take a stand. I am sorry that your mom was offended at first but that is sometimes just and initial reaction and her love for you and your child will always win out in the end. Let us know how you go decluttering those toys and whether she chose to keep them at her house and gives you her blessing to pass them on to someone else. A little hint ~ It pays to use the suggestion that you would like to donate them to someone in need. Maybe you could also suggest to your mother that she could start a college fund for your child instead of spending the money or things he doesn’t need. I really like the idea of taking some toys over to your mom’s so the kids can play with them there. You get rid of the clutter and the kids can be entertained over there also! $15.50 for a Tupperware bread holder!?! Good for you! Thanks Cindy. I don’t know what the attraction for old (vintage) tupperware is but it always sells. I am getting ready to declutter the couple of dozen teacups that we inherited from an uncle of my husband’s when he died. I only wanted one or two, but got probably 15. That is too many teacups and what on earth would my kids want them for??? Nobody drinks tea out of china, not in America anyway! So they are going to go. I am keeping the bear just to inspire me to keep on decluttering, slowly but surely. And yeah, congratulations on the bread holder. That’s amazing! I had already planned to write this article before we had our recent discussion of the bear but I do wish I had thought to add the bear photo to the blog for a laugh. I have added it now, I hope you approve. If not just let me know and I will take him down. He actually looks like his has his fists up ready for a fight. Under the circumstances with your bear and you mothers situation, I would keep the bear too. Good for you decluttering the tea cups, like you say one or two is plenty. I LOVE the picture of the bear being on your site. And I gave you permission when I took it to use it somehow, so I am just sitting here giggling about it. He really does look ready for a fight against the clutter, doesn’t he? I have lots of craft items that I have not yet decluttered. I bought a bunch of art supplies that I do not believe I will ever use and I need to find someone who will. And I have some beading stuff that I never learned to use. I may take all of that to a friend tomorrow, but I need to think about whether I am ready to do that or not. My mom is specializing in being difficult right now, but I think that’s because her biopsy is tomorrow. I don’t blame her – I would be very difficult if it was me in her position! As for those craft items you deal with them when you are good and ready a not a minute sooner. You will know when you are ready to part with them. I only wish you lived closer, I could teach you beading. I can understand you mom being out of sorts and difficult right now, they are hard times she is going through. I wish her all the luck with her biopsy and hope things tern out for the better. Be strong for her. A big comforting hug for you form me. The bear’s eyes (I am informed by my mother) are set deeply in with wire or something so that if the bears are given to babies or toddlers, the eyes will not come loose to be swallowed accidentally. Which means I could never remove them and put them closer together. Yes, I actually had this conversation with my mom the other night! I don’t think she is finding the whole declutter bear as much fun as we are, but then again she is going through a pretty rough time and may be taking things more personally than she normally would. The bear is definitely growing on me, although if you could see the fabric it is made of more closely, you might understand the creepy factor. The bathrobe was terry cloth and you can tell the fabric came from a bathrobe. It’s really quite icky! LOL But my little decrapify bear will stay here to inspire me. If not china, what do you drink tea out of in America? We drink more coffee in America than tea, but when we have tea, it is almost always in the coffee mugs. They are not nearly as pretty and refined as china, but they are sturdier and dishwasher safe. I think that the “tea” ritual is something that never caught on here in America and, though we do drink it, it is not an every day event or “meal” as it is in England and other countries. Hence, the teacups are simply ornamental and decorative. And the real move these days here is to drink as much water as possible. We do have Snapple brand tea, which is drunk directly from the manufacturer’s bottle and some people from the south drink iced tea from mason jars. I think it’s a shame that we don’t have this refined habit, but it will help with my decluttering. I have a mug that I use almost every time I have hot tea that is dark blue, chipped, and was brought home from my husband’s work as something they were handing out. We also use a large white “big” cup to warm up spaghetti sauce. And when my parents visit and have coffee, it is served in our mis-matched mugs. So I guess we are getting the job done, but in a much less pretty way. Chelle, do you have a place to give your teacups to? At our nursing home, they use these for special days like Mother’s Day, Father’s Day, and Christmas tea. They might welcome a donation. Actually I too drink my tea out of a mug, but it is a bone china one because I think the tea tastes quite different (and better) in bone china than in pottery! And yes, it was a serious question. I so totally wish we had tea in America. It is one of my favorite things to do when we travel to canada or when we went to england. I love cucumber sandwiches, scones etc. I especially like how people just take a little break to refresh in the afternoon! I’ve been doing this lately Colleen, because I don’t want my kids modelling my behaviour when they’re adults. My 11 yo daughter already has to be nudged to get rid of stuff (presents, clothes, etc), not because she doesn’t need or want them anymore, but because she thinks I’m going to be offended that she didn’t like something! It took me a long time to recognise that this was her *block* when it came to getting rid of things! I was in a potentially awkward situation recently, when a very good friend showed me the earrings she was wearing (a bridesmaid’s gift from a mutual friend). The wedding was 7 years ago, and I received the same earrings as a bridesmaid gift, but gave them away recently (not my style, and I have a similar pair that I like better). The bride was there too, and I was hoping like mad she wouldn’t ask me if I wore mine! Thankfully she didn’t, because I KNOW she would have been terribly offended and upset to know I don’t have them any more. I am glad of two things in relation to your comment. One is that you have recognised that your daughter holds on to things that you have given her out of obligation. Good for you for recognising this and I hope that means you have had a conversation with her to encourage her not to make this mistake for your sake or anyone else’s in the future. She must be a lovely girl for caring though. And secondly that your friend who was the bride either didn’t care whether you had the earrings of not or was at least polite enough not to ask. At least I hope it was one of those reasons and not that she was offended. I would like to think that, if she loved you enough to have you as her bridesmaid, she would care more for you than weather or not you kept a pair of earrings she gave you. Colleen, I’ve been reading you for a month or two, going through the archives, and getting a lot from it. This is a great post, and I must agree with Deb J. A gift is (hopefully!) given to delight the recipient. Anything that happens to it after the event is for the owner to decide, not the giver. I would hate to think that a gift I gave, no matter how perfect at the time (or not) would turn into a millstone around someone’s neck. I don’t want them having negative thoughts of me when they see the gift. I’d rather they get what enjoyment they can out of it, then pass it onward. And I’ll pay them the compliment of assuming they feel the same way. On a practical note: once I’ve sent a thank you, I have NEVER had someone ask about a gift they gave me. I do sometimes mention the things I particularily(SP!) enjoyed, to let them know I am still getting pleasure from it. Double score for them, and it makes up for the things I don’t mention. thank you for dropping in to leave a comment and welcome to 365lessthings. I hope you will make a habit of adding your voice to our group as I sincerely appreciated this one. I am glad that you have the liberty of feeling this way about the gifts you receive, clearly I feel the same way myself. I think it is a shame when people feel obliged to keep things out of obligation and more so that people feel the need to share their affection through material objects. When too much affection is tied to these exchanges complication can set in. Like you, I have never had anyone ever ask me what happened to something they gave me. Now that I have communicated my desire for no more material gifts and my loved ones have happily cooperated, there should be not problem for me in this area in the future either. I appreciate this post, because this is an issue that comes up again and again with my mom. I love her dearly and don’t want to hurt her, but also feel that I owe her enough honesty in our relationship to be frank! Which translates into: it means she knows my minimalist leanings and process but I don’t need to bring up specific items. I believe that if they came up she would chalk it up to a larger inclination and not take it personally, but I also know that because she imbues objects with a lot of emotion it might be a sore spot. Such as the set of plated silver flatware she gave me for my wedding…we never, ever used it (though pretty) because my husband has an intense aversion to the feel & taste of the silver. My mom received it at her wedding to my dad, from whom she is many years divorced (along with another set she kept). I gave it to a good friend and neighbor who was talking about wanting to buy a set. I suppose the topic may come up someday at a neighborhood potluck, but I won’t worry about it til then…the item is being used! I am glad that you can be frank with your mom regardless of the risk and manage to stand your ground under pressure. And best of all you can do all this and your mom still loves you. I am also glad you didn’t need to go far to find an appreciative recipient for the silver flatware. I agree in theory but in my life people aren’t always perfect. When my mom was alive it was easier to just keep the things she gave us and bring them out when she visited. It wasn’t worth the upset it would have caused her. This weekend I am parting with a ghastly blanket she had given me, flowery, embroidered with a mawkish sentiment about daughters, and pink. Definitely not me but also not a huge space hog and not worth hurting her feelings over. Some people don’t really give you things but stay attached to them and if they are family sometimes I think maybe you find a place for them where they won’t disturb your life (like the attic between visits) and draw your line in the sand somewhere else. Friends are different but family comes with built in quirks. I concede that sometimes the only diplomatic thing to do in act in the way you suggest here. I am just glad I have not been forced into this position. It must have been very liberating to see the last of that blanket. I finally effectively dealt with some obligation clutter in the form of a large antique frame housing a picture of one of my husband’s ancestors. My husband’s mom and sister gave us the frame and picture with great enthusiam. My husband could care less about it and there was no space (or reason) to hang it, so it sat in the basement for easily two years. Last week I took the picture out of the frame and had a beveled mirror cut and installed in the frame. It now hangs in a previously desolate spot in my dining room. The picture will go in an acid free archival box with other genealogical momentos. Two problems solved with one piece of clutter. Win! well done, a smart solution to the the problem. This just goes to prove once again that no matter how good the intention is behind gifts they aren’t always received with the same enthusiasm. I know surprises are nice but sometimes I think if a gift must be given it is best to ask the receiver what they would like. I am sure I have given lots of gifts in my time that weren’t as gratefully received as I thought they were going to be. Sometimes things that you don’t think will turn into obligation clutter do. I always saved every piece of art or craft my grandchildren made, and over the years, they’ve made quite a bit. The last few years we’ve shared our home with my brother, and I’ve lost use of quite a bit of space. I’m feeling kind of “closed in” lately, so will be looking for more things to thin out. I’m thinking that I might have to whittle down the art and crafts from the kids, and just keep one or two pieces from each, and then recycle the rest. It’s great hearing how everyone else deals with their obligation clutter. I think what you are intending to do sounds reasonable to me. Perhaps too you could offer the art works you wish to declutter back to your grandchildren’s mother before you declutter them. Or perhaps you could scan them into digital images so you can at least look back on them if you want to and share them with the grandchildren when they get older. Colleen, thanks for the suggestion to scan my grandchildren’s art! I didn’t think of that. My pleasure Becky, this way you can have your cake and eat it too. I just wanted to comment that many times people don’t even remember what they have given you. You could hide the item for a while and see if anyone notices before you dispense with it. you are probably right about that. Most people aren’t usually a problem it is that one person who holds too much importance in the matter that is prone to cause a fuss. There are so many examples of this! My mother gave me a special yoghurt cheese maker gadget her sister gave to her, in the hopes I would use it when she hadn’t. I do make my own yoghurt (much cheaper than buying soy yoghurt) and I did some years past turn this a few times into yoghurt cheese using cheesecloth and a plastic sieve. But I never used the gadget – I’m happy to eat my yoghurt fresh and if I got the urge to cheese I could always use the old-fashioned method. your mother is not alone in this attitude but that is their choice. The thing about decluttering is that it can’t and shouldn’t be forced on anyone else. I am just glad that when you decided you didn’t want the yoghurt cheese maker that you felt the freedom to approach your mother about passing it on. Communication is very important in relationships. Yes, I’m very lucky in that my mother and I are both in major decluttering mode and we support each other. But as you say, everybody has their own lines in the sand. My line in the sand is in a different place than my husbands but that is OK because he has been so cooperative so far. So long as he doesn’t have a problem with me decluttering as much of my stuff as I want and he can do the same things will be just fine. Except that extra motorbike in the garage, I am not so sure I can be persuaded that that should stay. bless your husband for encouraging you to set up this blog. My husband brought home the paper yesterday and when I commented on the article for your crusade, he laughed and said that he had read it and thought of me as this has been a conversation we have often and this year i have decided is the year to de clutter. I have found pleasure in giving away a few very beautiful items to close friends which i knew they would enjoy and they had significance to them and also I know my grandmother would have approved. Also it gave me great joy to give to our daughter for a birthday several years ago a treasured Royal Dalton coffee set which was a wedding present to my husband and I from a dear friend of my mother and father and I adored her and it was signignificant as this special lady had visited me so often when I was in hospital for seven weeks prior to the birth of our daughter. We entertained a lot when we were in the early years of our marriage and so we had much joy from using then set, as i do believe in using things and we have passed that stage now, now opting for afternoon teas or lunches where I still have many lovely dishes etc so many that have been handed down from family but one only needs so much! Our daughter was thrilled with the gift and said she had goose bumps all day and how lovely it was to see her reaction, the smile was a memory I will hold in the heart. I think I will get better at this crusade of decluttering and I thank you and everyone who has contributed to your blog with their tips and their honest feelings of how it can be achieved. I loved the idea of the scanning of the grandchidrens craft as I have so much and our two chidren’s craft and every school book from kindergarten! My husband and I are planning on down sizing so this decluttering is not negotiable. When we moved a few years ago, I had many items that I was passing on and I took pictures which I downloaded into the computer and will put on a family disc as they each have a story. Good luck to everyone who is decluttering and keep blogging as it inspires and encourages us all to keep going! colleen for starting the blog. I will pass it onto my friend who are also in need of inspiration with this often daunting task. thank you so much for this lovely comment and welcome to 365 Less Things. I am so glad you are finding ways to pass your treasures on to others who will truly appreciate them. It is a beautiful thing to do and it helps to know that they haven’t gone to waste and you can visit them if you miss having them around. There comes a time in life that people have to take their mobility and their energy level into account when it comes to how much stuff they have around their home. Because all the things we own require care in one way or another. Even the size of the home can be a burden from a certain point onwards. I make sure that I keep these thoughts in my parents and in-laws minds because it is harder to make any necessary transitions the older they get. It can be very hard to come to terms with change but the freedom of not having that responsibility is soon realised once the transition has been made. I wish you all the best in your mission to downsize and I am sure you will be glad once it is complete. I hope you will find many useful tips here at 365 Less Things, both from myself, Cindy who writes on Wednesday and my wonderful readers who leave comments about their experiences. I hope you will be one of those to share with us the lessons you learn along your journey so that we can all benefit from that wisdom. Thank you again, you are most welcome here. Fascinated to read what everyone is saying. This is like a bright light has gone on in my life. I had been ridding myself of unused furniture, objects, etc in a desultory fashion but now am determined to do the throw-away one thing per day and look forward to a more decluttered life. I am old now but still remember my Grandma’s comment “when I give you something it is yours to do with as you wish” and I have always lived by that myself. Many thanks for this wonderful idea. welcome to 365 Less Things and thank you for leaving this comment. I am glad this post has renewed your determination to declutter your life. And God bless your grandma for giving you permission to do what you will with the things she gave you. She must have been a wonderful woman. This has been a real education for me, I love that you have started this blog and wish you every success with it. Just recently a dear friend, who is an artist, decided to declutter and gave me boxes of ‘stuff’ because she said she didn’t want to keep them any more and she thought I would be able to use them. I felt really burdened at first because I am trying to declutter myself but one day in a fit of resolution I took them all to my art class to offer them to anyone there and if they didn’t want them I took the residue to an op shop. I did not keep any of this ‘stuff’ for myself. My friend, fortunately, has not asked me what I did with the things she gave and I know she set great store by her gift. She is a very fragile kind of person so I don’t feel free to tell her, but it has taught me a lesson, not to try to unload my unwanted stuff on others, I take it to an op shop, although I have to admit some of it went into the bin. I got in through share and enjoy as well. No problems! Why don’t you give us a link to your latest interviews – I’d love to hear them. I’ve heard one before. I will throw the links up to the interviews on Simple Saturday this week. I am here, visiting you, per your request. Wow, you got A LOT of comments on this post. How much has readership increased since all your publicity? I don’t know the answer to the question about readership. I will have to ask Steve. Thanks for doing the test for me. Wow, I’m going to be dealing with this issue next week when we visit family. My mother-in-law has started giving things away to her children. She told me and her daughter that she was clearing her clutter by giving it to all of us. I told her that I was in the process of decluttering my own house and my sister-in-law said she was doing the same thing (you should have seen my poor sister-in-law’s face fall when her mom told us that). After talking with my husband we decided that we would accept anything his mother chose to give us; however, whether or not it stays in our house is another thing. I will not give away anything that my husband wants to keep; and he knows that there will be things that I will refuse to keep. Luckily my own mother is of the go ahead and get rid of it way of thinking. What’s interesting is when someone tries to turn something you’re de-cluttering INTO obligation clutter. A little more than a year ago, I started to de-clutter my paper pics. I was scanning them (then got irritated and took pics of each so I’d have a back-up on the camera disc if something happened to the external) and mentioned to my sister I was tossing (recycling) the pics. She was horrified! How dare I toss something as a picture!!?!?!?!?! I informed her that it was what I had chosen to do….it was MY pictures, not anyone else’s. I was confused at why such a intense emotion. Yes, my mom is a HUGE picture taker (soooooo not exaggerating! TONS of pics) and my sister and I inherited it from her. I prefer mine in digital. My sister takes digital pics and then prints them as well. Ummmmm….why? “I like the feel of a photo album.” My response was that was okay, but I didn’t….I like having them on the computer in front of me to click on a folder and not have to dig through who knows how many albums to find a certain trip or pic. She BEGGED me to send her the “personal” pics…the one of family members….even IF she had a copy as well. I did keep a handful to send her, but nearly every single photo has been tossed. Good riddance. I love my sister, she loves me, but I can’t let HER issue become something I HAVE to keep b/c she THINKS I should. Sorry sis….nope….should’ve known who you were arguing with. I tend to be like my dad, once my mind’s made up…that’s it.